My first novel. Optioned by Multistory Films in early 2011, it is currently in development as a feature film. I am working as script consultant on the project. For a brief time prior to launch, Abaddon Books circulated their shared-world bibles widely and encouraged submissions from anyone who wanted to pitch. I sent in three one-page outlines; two for Pax Britannia (now the sole domain of the estimable Jon Green) and one for The Afterblight Chronicles. I was asked to work two of these into full pitches – sample chapters and synopses. This is the one they chose to commission. It became the first book in a trilogy that eventually comprised Operation Motherland and Children’s Crusade. At the time of writing the book is running at 4 stars both on Amazon.co.uk and Amazon.com and 3.94 on Goodreads. Please feel free to visit any of these and add your opinions. The inevitable comparison with any story of this sort is with schoolboys-on-the-rampage tale The Lord of the Flies. But, to be honest, the only similarity here is that it’s centred on a group of boys. School’s Out is irreverent, blackly humorous, violent and generally good fun. It’s never going to be held up as a literary classic, but it is thoroughly enjoyable. The narrator and hero, Lee Keegan, is one of the survivors of a flu virus that wipes out around 90% of the planet’s population; knowing that his soldier father has the right blood type to have also survived, he remains at school waiting for his dad to return from Iraq. As other pupils and a handful of teachers return to the school, so does the school bully, and things turn violent. As the school is private, it has all sorts of handy things, like an army cadets’ group and a stock of old rifles – just what a group of high-minded boys need in a post-apocalyptic world. You might be put off by the fact that this is a story set in a school, with mostly very young protagonists. It doesn’t really matter; the book is about action rather than deep and meaningful depictions of teenage angst. The tale reads like a black comedy; the nearby town is run by tweed-clad fascists and religious extremists, who are as determined to take control as anyone else. While there is a lot of gore and plenty of killings, the violence is never disturbing. In that respect you could liken it to the film Dog Soldiers; blood by the bucketload but not exactly nasty. You could give this book to older teenagers without fear. And to be honest, most high-school pupils will have probably read worse or seen worse in film. 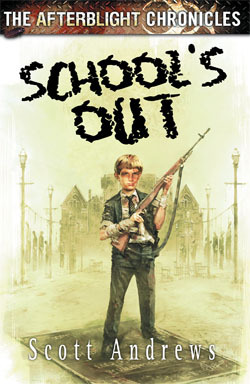 REMEMBER THE OLD BRIT-FLICK IF, where a private school pupil goes nuts and machine-guns his teachers? Throw some cannibalism and crucifixion into the mix and you have School’s Out, a taut little shocker narrated in the first person by a tough but reclusive 15-year-old called Lee. Angry and rebellious, the lad is living in a futuristic society where anarchy reigns. Tackling class divides, and hinting at a broader attempt to address the War on Terror, this third installment in The Afterblight Chronicles returns to the fascistic, draconian themes that were also highlighted in previous entries. Although easy to get involved with, Andrews’s biggest mistake is assuming that the boarding school setting is relevant to his story or that his lead character is the slightest bit identifiable with.